The Glocknerhof team consists of an innovative kitchen brigade, a friendly and obliging service team in the restaurant, helpful caretakers for maintenance and repairs, and hardworking chambermaids who look after the rooms and the buildings. Reception is the responsibility of Christine, operations management and external care are down to the Hotel manager Adolf and his juniors, Daniel and Lukas, who are the third generation of the same family to work with us. Would you like to support us? Wonderful! We can offer you a lot at our Hotel. Amongst other things you will have an opportunity of taking on new challenges, accepting responsibility, obtaining further training, acquiring knowledge, expanding your skills and being part of a team. We always enjoy meeting motivated people and including them in our team. 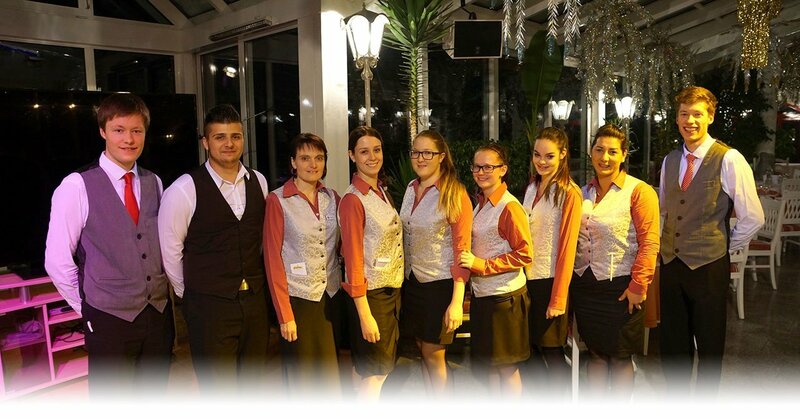 Kellner/in, Frühstückskellnerin, Chef de Rang, Commis de Rang, Servicelehrling, F & B Trainee, Gardemanger, Patissier, Jungkoch, Chef de Partie, Sous Chef, Kochlehrling, Geschirr-Reiniger, Aushilfskräfte Küche/Service, Receptionist/in, Zimmermädchen, Gouvernante, Hausmeister, Wanderguide und Praktikanten für alle Bereiche (m/w). Hier die aktuellen Jobangebote im Glocknerhof! Wir freuen uns, dich schon bald kennen zu lernen!